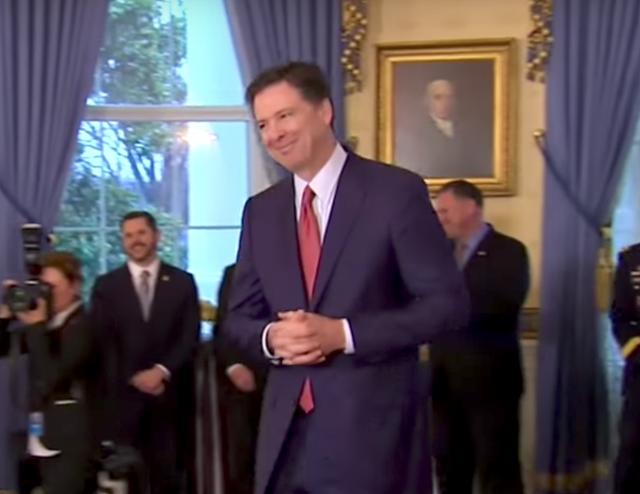 In the video above, Benjamin Wittes, a and friend of James Comey (and senior fellow at The Brookings Institute) - recounts the former FBI Director's interaction with Donald Trump just two days after his inauguration. There were many moments of this exchange worthy of nonverbal nuance.What follows is a partial nonverbal analysis. The second video (immediately above) is the same event, only unedited. In the image above we see the two men a fraction of a second after their initial, hand-to-hand contact. Here is a closeup cropped image of that same instant. Although it's a lateral view, this very brief facial expression (microexpression) is in complete agreement with Mr. Wittes' description of Director Comey's Disgust. It's certainly present here - the flared nostril, the tightening of the tissue below the nose and above the upper lip, and the angle of the corner of his mouth. If we were to view his face from a forward angle, Comey's nose would be "wrinkled". Now - let's go backward a few seconds. As Donald Trump says, "Oh, and there's, um, [hyperbolic air kiss/pucker, arms extended, hands tilted primarily upward] James [pause]. He's become more famous than me [audience laughter]. Director Comey." The President's melodramatic/false air kiss/pucker, extending his arms with his palms upward - was very much a pseudo - "Come to Daddy" nonverbal cluster. It's a significantly patronizing gesture - asking/demanding the then FBI Director to walk across the room to him. 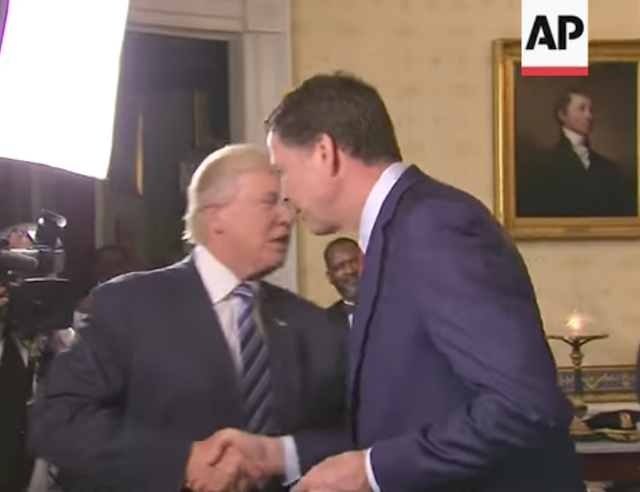 As James Comey walks across the room to the new President, he keeps his fingers intertwined - both vestigially from a moment before - in deference to the Office of the Presidency (note most everyone else in the room is in a fig-leaf or similar configuration) - but also largely reflecting his hesitancy to shake Trump's hand. 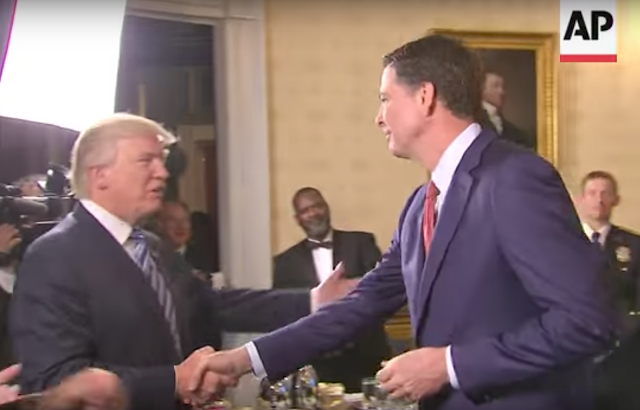 Upon grasping James Comey's right hand, Donald Trump pulls him in, close to his torso. 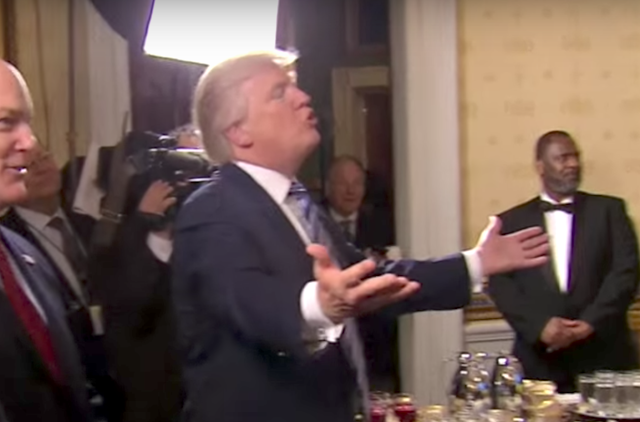 This is Trump's default handshake choreography. When it's a behavior displayed over time, it also is highly correlative with Narcissistic Personality Disorder. Trump then transitions into a hug - which, as Mr. Wittes observes, is one-sided. 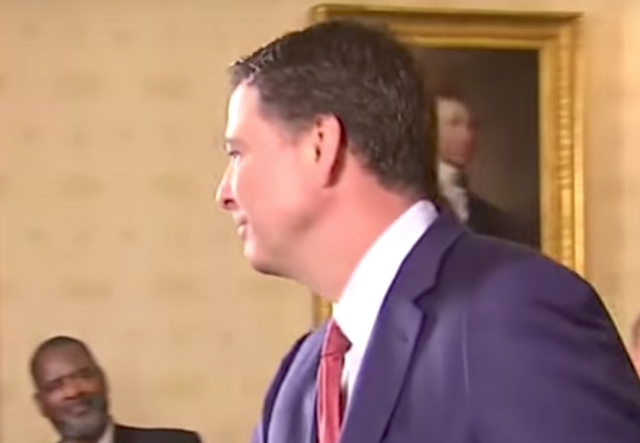 Director Comey turns his torso to his left (and very probably his feet were pointing to his [Comey's] left too) - already rotating away from Trump in an effort to minimize the torso contact - which allows Trump to whisper in Comey's ear (both poor etiquette and further patronizing). Note Comey's left arm - the upper portion (humerus) is posterior to his torso - distancing himself from Trump - yet the lower arm/hand held in readiness should it be needed to insulate further from any proximity to Trump. In this last image, we see a beautiful example of a well described nonverbal phenomenon known as a "Partial Emblematic Slip". You'll notice that Trump's forefinger, ring finger and pinky finger all partially contracted - however, his middle finger is extended. Breaking down the nomenclature - this is an "Emblem" - because an extended middle finger recognized widely for its meaning. It's "Partial" - due to the fact that it's not held high, finger pointed up, in a fully expressed manner. And it's a "Slip" because it's not consciously initiated - rather it driven by the subconscious. Trump's psyche is flipping Comey off. As was told by Comey's friend, Benjamin Wittes - James Comey did indeed feel disgusted toward Trump in this moment. 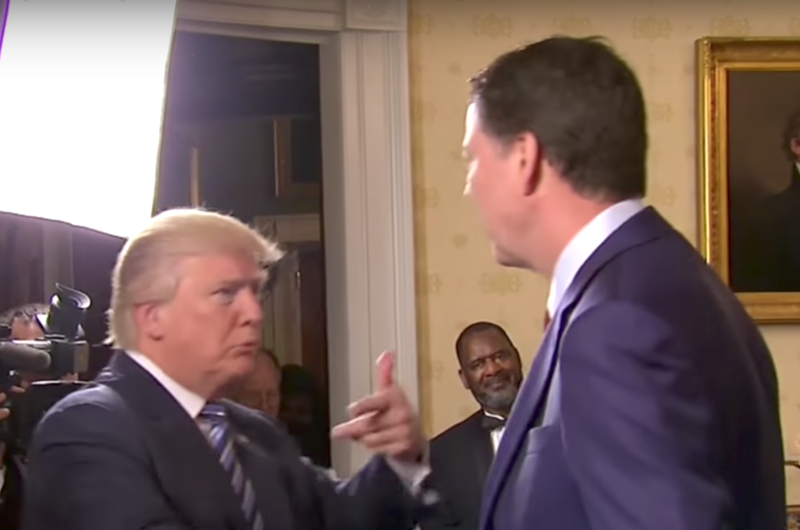 And not only was Donald Trump very patronizing toward the FBI Director - Trump's subconscious flipped Comey the bird too.